The doctor is IN. 5-cents, please! 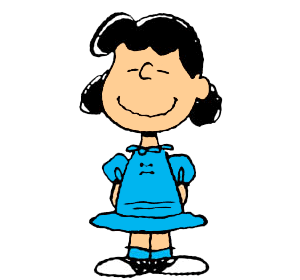 Lucy. Is interesting. I may or may not wholly relate to her. Pretty bossy. Kinda crabby. Slightly cynical. Always threatening to slug somebody. The take-charge veneer, I suspect, is a shroud to hide her vulnerability. But her rates for psychiatric services were very reasonable.